Las Adelfas is botanic haven of stunning town house apartments within15 minutes of Tenerife South Airport and close to Tenerife's most famous golf courses, "Golf del Sur" and "Amarilla Golf". . Golf Del Sur is a golfer's paradise, but is also an ideal destination for those who just want to relax around our two stunning swimming pools. For the more energetic, Tenerife enjoys some beautiful natural spots and is ideal for trekking. Families who do not want the hustle and bustle of larger resorts have the benefit of two kiddie pool areas. We are within 10 minutes from Tenerife's main motorway (the TF1) so Las Adelfas is an ideal base to explore the rest of the island or visit some of the many theme parks, including the famous Siam Water Park. A short walk from Las Adelfas at San Miguel, there is a lively Marina with restaurants and shops overlooking the Ocean and the San Blas Commercial Centre is a combination of shops, supermarket, bank, bars and restaurants, while just a 25 minute car or bus ride will take you to the bustling resort of "Playa De Las Americas" and "Los Cristianos". Charming excursions like the majestic volcano "MT. Teide" or "Güímar" Pyramids are also available to guests wishing to discover the fascinating Canarian culture while a visit to the small fishing village of "Los Abrigos" (10 minutes by car) will enable you to eat at the best fresh fish restaurants on the island. 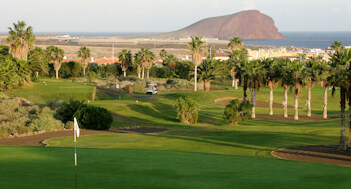 Although Tenerife and the surrounding Canary Islands are Spanish in ownership, they are closer to Africa than anywhere else, lying in the Atlantic Sea, a mere 200 km from the North West coast of Africa, Tenerife can produce such diverse climates normally only found on a continent - snow falling on the hills while the beaches only a few kilometers away enjoy fantastic weather. Because the temperature doesn't fluctuate very much throughout the year, Tenerife is know as "the island of eternal spring". Tenerife temperatures regularly hitting 30 degrees celsius during the summer months, however with the fresh trade winds, sea breeze and refrigerant gulf current, it remains very pleasant!